I walk to college and home again by different paths. There, over the crest of a hill, along the narrowest of provision: the edge of a curved blade. And back, around the side of the hill, along wide pavements: the blade’s face. There, the direct line, taking my life in my hands on the main road. And back, along the scenic route, taking my time through leafy neighbourhoods. It is a routine walk, a rhythm to my day. It does not have to be just functional. Today I was arrested by the different quality of the light, early morning and mid afternoon, and moved to respond. I feel as if anything is possible. but certain days obscure truth. This morning I was out raking leaves from our back lawn (it’s that time of year again!) when my neighbour called over the fence to me: do you eat tomatoes? We do; and he gave me a tub of tomatoes he had grown in his greenhouse. Three varieties: a small orange one; a medium-sized yellow one; and a larger red one. That’s an example of the social economy at work. The foundational question underlying the market economy is: how can we maximise our profits? The foundational question underlying the social economy is: what do we need, and who can we share our surplus with? Churches can operate according to the principles of market or social economics. Churches that operate according to the principles of the market economy are concerned to enlarge the customer base (bums on pews) who will pay for (through tithing) their product (worship experience, sermons, children’s work, etc.). They are essentially inward-looking, or attractional, in their relationship with their neighbours. The greater the number of products they can develop (programmes, niche interest groups, etc.) the wider the potential customer base they can appeal to. Churches that operate according to the principles of the social economy are concerned to bless those beyond their fence, without expectation of anything in return (it is not that they do not hope for a response, but that they do not hope to benefit from any response: rather, they hope for responses that in turn benefit another). They are essentially outward-looking, or incarnational (i.e. taking the nature of a servant), in their relationship with their neighbours. The more content they are with living within their means, the more they have to give away to others. Do the values of your church reflect market economics, or social economics? And how might we effect a change of fundamental attitude, from market economic to social economic values? Five-fold spirituality is concerned with being released into the role you were created for. It has to do with ‘whole-life’ discipling: that role being expressed through your contribution to society, not (just, or even first and foremost) your service to the Sunday service...It is part of the church being equipped to be the agents through which God changes the world, through whom God’s reign is exercised. An apostle will parent differently to a pastor. And that’s okay: you can’t be all things to your child, but you can trust God for your children. How have you been made? How can the church support you in that role? The 5-sided Lifeshape is a tool for discovering the role God has created you for within his Church, and helping us to work through the dynamics – both positive and negative – that result from the fact that we each have different roles to play. Within Lifeshapes language, we refer to this as five-fold ministry. Alan Hirsch and Michael Frost have also written extensively on this (see The Shaping Of Things To Come): they use the term APEPT. Ephesians 4:4-16 presents us with a gift list that is qualitatively different from other gift lists in the New Testament. Romans 12 is concerned with gifts that God gives to people, and the main principle being brought out here is that we should exercise those gifts not in accordance with the measure of our gifting or our experience but according to how much faith we have. 1 Corinthians 12-14 is primarily concerned with how gifts (whether those gifts are people or abilities) are exercised in the gathered church, with the main principle being that love for one another, as opposed to competition amongst each other, is the key. But Ephesians 4 is concerned not with gifts given people but with people given as gifts. Ephesians 4 identifies five types of people: apostles, prophets, evangelists, pastors and teachers. Verse 7 – “grace was given to each one of us” – suggests that this is not merely illustrative examples from a wider list. Some have argued that the New Testament uses other metaphors for role, such as builders or farmers; but I would contend that the types in Ephesians 4 are not metaphors (even if ‘pastor’ derives from ‘shepherd’...which makes shepherd a suitable metaphor for the pastor). Verses 8-9 present us with the image of Jesus, having broken out of hell, leading a procession of freed captives, who are given as gifts. This image strongly suggests to me that these types are of the creation order, rather than the redemption order. That is, God does not confer upon you the state of being an apostle, prophet, evangelist, pastor or teacher at the point of conversion; but that we are apostles, prophets, evangelists, pastors or teachers held captive until we are set free to find the fullest expression of these roles within the Church. That means that these words are not religious words, as such; and that we can identify signs of this creation order gifting in those who would not identify themselves as Christian. And helping people to understand more fully how they have been made has incredible potential for discipling such people towards faith. It also means that we would be wise to help Christians to identify how God has made them in this regard, in order to equip them to fulfil that role within God’s mission in the world, in its widest sense. What follows is a summary introduction to each potential people gift. Apostle means one who is sent out. Apostles are pioneers of the new frontier, created to move into uncharted waters. They are not made to sustain the status quo. Apostles would include entrepreneurs such as Richard Branson, who goes into new areas of business; who puts others in place to populate and settle the ground; and who is not afraid to sometimes surrender the past in order to achieve the future. Apostles would include those who are brought in to ‘turn around’ a failing school or institution; but for whom it would not be appropriate to stay there long-term. So apostles need to work with others. Because the Church has undervalued the role of apostle, it has found it hard to take ground lost by previous generations: pastors and teachers aren’t best designed for that. But apostles tend to see the world in very black-and-white terms, which can result in massive personal fall-out (see Paul and Barnabas; Paul and Peter). Prophets imagine a world which is different from that in which we find ourselves (in this regard, they differ from teachers, who explain the world as it is). This might be expressed in terms of the creative arts. It might also manifest itself in relation to social justice or environmental action. The Church has always had a prophetic voice (both the arts and the justice), but has not always known how the prophets relate to the body. As a result, many prophets have found their community outside of the Church, often in prophetic movements, such as the Green movement. While prophets may be concerned with social justice they differ from pastors in that prophets have a big-picture view, which is too big a burden for the pastor, concerned for individuals, to carry. But the individual can be lost in the big picture, so prophets need to work with pastors...and simply having a big picture is not the same as being able to bring change about, so prophets need to work with apostles...Many prophets experience marginalisation (outside the Church as well as within it), and prophets often have a significant measure of brokenness in their past, of which they may or may not have experienced healing. Teachers love to communicate ideas, to pass on learning. And so we might expect to find teachers in the teaching profession – although, again, it would be disastrous if every teacher was a teacher in this sense (the teacher who impacted me most was an evangelist for his subject; schools also need apostles, prophets and pastors). Our overly academic teaching culture has (mis-)shaped the function of teacher within the Church, resulting in cognitive knowledge as opposed to active belief. The exclusion of APE roles has only served to exacerbate this dilemma. We need teachers; but only in the context of a more rounded understanding of the people God has given as gifts to his Church, for the world. We need teachers who won’t shape those they lead into a teacher mould. The Lifeshapes Circle is a tool for choosing to learn from life. However, it differs from other experiential learning models in that its underlying purpose is to enable us to experience God’s kingdom breaking in, as we move from a worldly perspective to a heavenly one. In this sense, it describes for us the process by which Romans 12:2 happens (“Do not conform any longer to the pattern of this world, but be transformed by the renewing of your mind. Then you will be able to test and approve what God's will is—his good, pleasing and perfect will.” Romans 12:2, NIV). Mark’s Gospel introduces Jesus’ mission with the summarising statement, “The time has come...The kingdom of God is near. Repent and believe the good news!” (Mark 1:15, NIV). 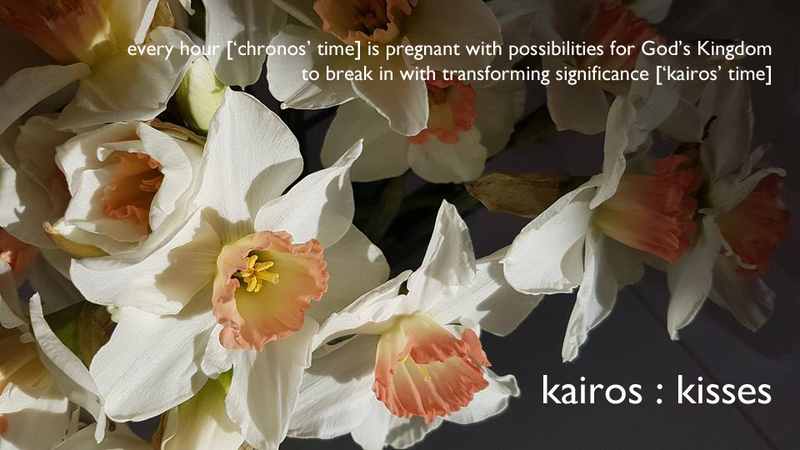 Here ‘time’ is not chronos (chronological time) but kairos (time as event or moment of opportunity; eternity time that interrupts chronological time from outside); ‘repent’ is metanoia (change of mind); and ‘believe’ is pistis (active response, rather than mere cognitive consent). The Circle begins with a kairos moment, and breaks down both repentance and belief into practical steps – that is, it de-mystifies these terms for people. Matthew 6:25ff gives us an example of Jesus taking his disciples through the process of repentance and belief. The context is the Sermon on the Mount, where Jesus is teaching his disciples, and a large crowd are listening in. I want to suggest that he isn’t talking about worry about life because he’s compiling a book of Proverbs, but because he has observed that his disciples are worrying; he may even be responding to their articulating their worries. Repentance begins with ‘observe’ and ‘reflect.’ So far, so Kolb. Except that Jesus isn’t interested in getting his disciples to observe and reflect on the situation they face. Indeed, they have been observing and reflecting, and that is part of the problem! Because they’ve been observing the wrong thing, and reflecting with the wrong perspective. Jesus wants them to observe and reflect on birds and flowers (you can imagine how that would go down with their mother-in-laws). Jesus wants them to observe and reflect on what God is like. There is another key element to the process of repentance, and that is ‘discuss.’ It doesn’t necessarily come out in Matthew 6 (I’m looking for illustrations of principles, not proof-texts); but in the Gospels we often see Jesus taking a discursive approach. The ‘discuss’ element helps make explicit the point that discipleship works best in community, that repentance that leads to believe that leads to the kingdom breaking in is better when we repent and believe together, as opposed to on our own. Having arrived at a change of mind, what is required for practical, active believing is a ‘plan.’ In the example we’re looking at, the plan is: we’re going to trust God to provide. That’s it? Yes. That’s not a plan! Where are the action points? Okay:  We’re going to trust God to provide food  We’re going to trust God to provide clothes…You see, this is not about arriving at pragmatic solutions – though by that I’m not denying the need to plan in more concrete ways in certain situations. The pragmatic plan in response to the hungry crowd of over 5,000 is: next time, we’ll put “Bring a packed lunch” on the bottom of the flyer, or charge everyone a £5 conference fee and hire in outside caterers. The pragmatic solution to the paralytic lowered through the roof by his friends is: we need better disabled access here. I’m not dismissing caterers or disabled access; just pointing out that they miss the point of what happens in these stories: that the kingdom breaks in because Jesus sees the situations from a heavenly perspective and not an earthly one. But having a plan is not enough. We need to hold one another to the plan. The next practical element of believing is ‘account,’ or, put in place accountability. Matthew 6:25-34 is followed by Matthew 7:1-6. That is, don’t judge others while not being prepared to be held accountable and helped to live out what we believe ourselves. And don’t throw your pearls to pigs, or, don’t waste your time trying to involve those who aren’t prepared to engage as part of an accountable community. That is the Circle: presented with a kairos moment, an opportunity to repent and believe and thus experience the kingdom of heaven break into the here-and-now, we ought to respond. That response is not a pragmatic one, but it is practical as opposed to esoteric or mystical. We can learn to cooperate with God’s desire to transform our perspective, and therefore experience more of what he wants to do through us than we could have imagined.